Fifteen University of Adelaide students were awarded 2017-18 Summer Research Scholarships at Waite. They each have spent a minimum of six weeks between December 2017 and February 2018 participating in a research project in areas such as viticulture, plant pathology, or plant genetics and breeding. The purpose of the scholarships is to encourage undergraduate students to consider undertaking postgraduate study at the University of Adelaide leading to a career involving research. The Scholarships provide a stipend of $250 per week, provide an opportunity to work with leading researchers here at Waite, enable the students to see what research is really about, and introduce them to potential Honours and Postgraduate supervisors. 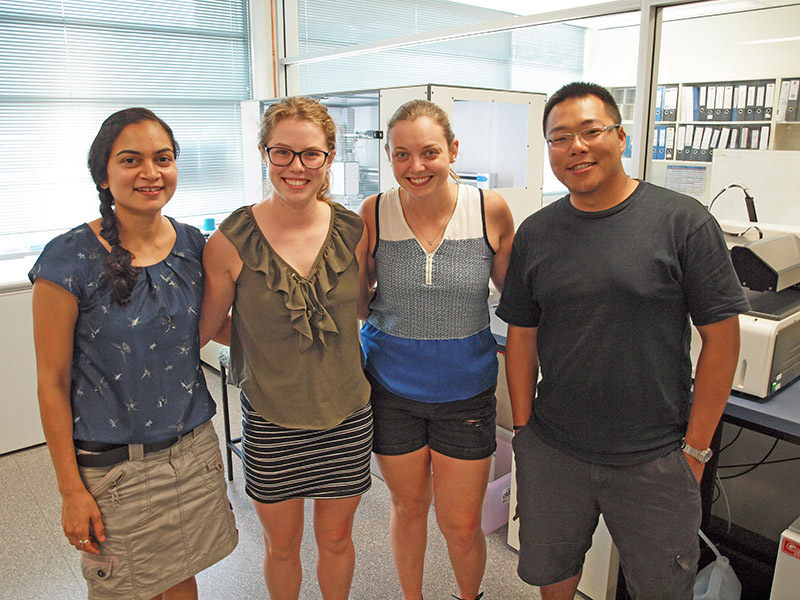 Student Karri Thomas (pictured) completed the first year of a Bachelor of Science (Biotechnology) degree in 2017, and completed her Summer Scholarship in Professor Diane Mather’s lab at Waite working on molecular plant breeding research. She says the program has provided the opportunity to experience how a ‘real-world’ laboratory works, outside of lectures and theory classes. Karri said one of the most surprising things she has learned is that lab research isn’t always serious and highly technical. “It has been a lot more fun and laid-back than I initially expected,” she said. Karri said she would recommend other students considering or curious about a research career to apply for the Scholarships. “They are a great way to get some lab research experience before graduation”. Around 40% of students who have been awarded Summer Research Scholarships over the last four years have gone on to do Honours or postgraduate research in the School of Agriculture, Food and Wine. Summer Research Scholarships for 2018-19 will be open for application later this year. Visit https://agwine.adelaide.edu.au/prizes/summer-scholarships/ for more information.